Jackboot: A History of the German Soldier 1713-1945, by John Laffin. Originally published in 1965, and now available from Barnes & Noble Books. Mr. Laffin found himself in the political crossfire from all sides when he wrote this book. He begins by quoting Frederick the Great in his opening chapter, What the Germans Think About War, "War is for the privileged, combat the ultimate honour." Laffin is a Brit with a very readable way of unapologetically delivering just whatever is on his mind with lines like, "Any soldier who has fought against the Germans will concede, even if grudgingly, that 'the Huns are bloody good soldiers." Why The Germans Lose At War: The Myth of German Military Superiority, by Kenneth Macksey. Published in 1996 by Greenhill Books in London and Stackpole Books in the U.S. Mr. Macksey asks the question, "How was it that a sophisticated organization which had contributed decisively to the unification of Germany in 1871, and whose members prided themselves upon honour and prowess, twice managed to stage and lose a World War..." And he provides a well-researched answer. The Germans, by Gordon A. Craig. Published in 1983 by Meridian. Mr. Craig's study of German culture earned him high praise from all over the map of journalism. The New York Times said, "It is impossible to convey fully the richness of this book." The Wall Street Journal: "The most gifted historian of Germany." And even the restrained Foreign Affairs opined, "Sparkling. Informative." Germany was the heart of the Protestant Reformation, a center of academia, music and literature. That is too often forgotten. Dreadnought, Castles of Steel, both by Robert K. Massie. Published in 1991 and 2003, respectively, by Random House. The first tells how Britain and Germany, ruled by members of the same family and friendly allies dating back to the Napoleonic wars, ended up in a rivalry, with naval dominance as the focal point, that neither could undo during the crisis of 1914. And the second describes how that naval rivalry played out for real when the shooting started. Massie is both a gifted writer and historian. This book contains some of the best literary portraits of both British and German leaders of the era-- from Victoria to Tirpitz. Bismarck: The Man and The Statesman, by A.J.P. Taylor. Published in 1955 by Random House. Still the definitive biography of the Chancellor responsible for the creation of the imperial system that united Germany in 1871. If nothing else, one comes away with understanding why it was so vulnerable to the abilities (or inabilities) of the Kaiser and the Chancellor. Operation Nordwind 1945, by Steven J. Zaloga. Published in 2010 by Osprey. This was the final German offensive, launched in January as a southern complement to the Ardennes offensive. With Patton's Third Army diverted northward, Hitler ordered a push on the remaining American and French troops in the Alsatian region. Order of Battle, German Infantry in WWII, by Chris Bishop. Published in 2008 by Zenith Press. Every infantry division, Heer (including the 2nd Gebirgsjager) and Waffen SS, can be tracked from 1939 to 1945. Truppenfuhrung, by Generals Ludwig von Beck, Werner von Fritsch, Otto von Stulpnagel. Published in the United States in 2009 by Stackpole Books. This was the German army manual for unit command in World War II. Written in 1933, it formed the tactical operational doctrine that the Wehrmacht took into battle six years later. This was the document that synthesized debate and testing of the lessons from WW1, a process that did not occur in the victorious nations, which is the predominant reason the German Army defeated them in 1940. As we well know, reformers in the Allied military found themselves sidelined (deGaulle in France), even courtmartialed (Mitchell in the U.S.) Studied extensively by the U.S. military, much of it was adapted post war. "I would strongly recommend this book to military officers and NCOs"-- James S. Corum, Professor of Comparative Military Studies, USAF School of Advanced Airpower Studies, Lt. Col. U.S. Army Reserve. Reforging The Iron Cross: The Search for Tradition in the West German Armed Forces, by Donald Abenheim. Published in 1988 by Princeton University Press. 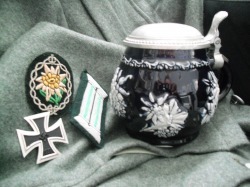 "In November 1985 the West German armed forces celebrated their 30th anniversary. The occasion went largely unnoticed in a world that three decades earlier had watched with the concern the rebirth of the German army and feared the danger it might pose to the young democracy of the Federal Republic.....an army created from the wreckage of Nazi Germany, which since its inception had struggled with the political ambiguities of its background as much as with the strategic and operational difficulties of its mission." Gebirgsjager: German Mountain Trooper 1939-45, by Gordon Williamson. Published by Osprey in 2003. This is an easily digested summary, loaded with details on unit history, training, equipment, illustrations-- the usual Osprey treatment. German Mountain Troops in World War II: A Photographic Chronicle of the Elite Gebirgsjager, by Roland Kaltenegger. Published by Schiffer in 2005. Other than personal photo albums, probably the most exhaustive collection of photographs and plenty of text to flesh out details about just about everything. "Today the accomplishments of the 'Men of the Edelweiss' are held in high regard by historians and military experts, and armed services and specialist units worldwide take their alpine and combat capabilities as an example. In mountain fighting, bad weather and difficult conditions often caused more casualties than the enemy." Weapons and Equipment of the German Mountain Troops of World War II, by Roland Kaltenegger. Published n 1995 by Schiffer (available through Barnes & Noble). Small book (48pages), but excellent pictures of Gebirgsjagers in action, training and their equipment. Contains short descriptions of mountain infantry equipment and weapons, mountain artillery personnel and weapons, and mountain engineers and their equipment. Hitler's Mountain Troops, by James Lucas. Published in 1992 by Arms and Armour Press, distributed in the U.S. by Sterling Publishing, Inc. A history of each Gebirgsjager division and their actions during WW2. 224 pages. The Coming of The Third Reich, The Third Reich in Power, The Third Reich at War, by Richard J. Evans. Published in 2009 by Penguin. Arguably the most up to date and comprehensive study of Germany's descent into political, social and economic chaos following WWI, and the subsequent dark re-birth under Nazi rule that lead to the pursuit and prosecution of WW2. Mr. Evans takes raw data like GNP, election results, any and all relevant numerical measurements, illustrates them with anecdotal observations from diaries of ordinary citizens, re-examines the journals and official documents, and ties it all together with the calculating and objective eye of an historian. The result is an exhaustive, illuminating and at times depressing study of Why, How and What Happened. There is no agenda here, other than the pursuit of truth. Ultimately, the facts and data speak for itself. Inside Hitler's Germany: Life Under The Third Reich, by Matthew Hughes & Chris Mann. Published in 2000 by MJF Books. The back cover reads: "It was hell for some. It was paradise for others. But for most of its citizens, it was simply where they lived. What was daily life like for ordinary Germans during those extraordinary years?" Filled with quotes from average people and photographs, it manages to highlight major points in about 200 pages subjects such as, Home Front, Women, Economy, Social Life, Terror, Resistance. After The Reich, by Giles MacDonogh. Published in 2007 by Basic Books. This book starts with the fall of Vienna and ends with the Berlin Airlift. The early years of the Allied occupation didn't start with anything as orderly or uplifting as the Marshall Plan. The Forgotten Soldier, by Guy Sajer. Published in 1967 and released in the U.S. by Harper & Row. Sajer was a common soldier in the Grossdeutschland Division. This is his personal story of what is was like to be an average soldier on the Eastern front. The fear, exhaustion, mud, snow and loss-- are all here. The Army of the Future, by General Charles de Gaulle. Originally published in 1934 and released in the U.S. in 1941 by Lippincott. In the forward to the U.S. edition, Walter Millis writes, "This is the now famous little book by a French officer on the principles of which the French did not act-- while the Germans did." Inside The Third Reich, by Albert Speer. Published in the U.S. in 1970 by Macmillan. Reading the personal memoirs of the participants and contemporary accounts of what happened should not be regarded as history's final word on their subjects. But Speer's account gives one a flavor of what it was like to be standing in the room when disastrous decisions were made, and especially what it was like to function in a regime where dysfunctional rivalries and political favor over-ruled talent and ability. We are fortunate that Nazi incompetence constantly undermined Nazi ambition. And page after page, the reader is confronted by the enigma of Speer: cognitive dissonance, naive ambition, calculating revisionism, ruthless careerism? At times he seems to embody all of these at once. Given the horrors unleashed on the Eastern Front and Speer's magician-like ability to keep war production intact and growing, one begins to understand why the Soviet Union singled him out in particular for prosecution. The German Talks Back, by Heinrich Hauser. Published in 1945 by Henry Holt & Company. Hauser was an expatriate who escaped Nazi Germany, lived in the U.S. and returned after the war to help re-build his home country. Doubtful that you'll find this book anymore, except in the shops of used book dealers. Reading it over six decades after it appeared, one is struck by the strength of this American publisher's commitment to the First Amendment for an enemy defeated twice in three decades. In their Notice To The Reader, they write, "This book is not a document written in the spirit of fair play. Its author is not an historian or sociologist, with the detachment of a scholar. He is a German; he doesn't like us; he does like Germany and the spirit of Prussia, which he believes made Germany great and may yet again make her a world power-- and hence a world danger...Most essential of all, he is describing something that may well be of life-and-death importance to the American people. That something is the way the German people feel about the war just ended, about the United States, and indeed, about the whole Western civilization of which Germany herself is a part. When the author's manuscript was submitted to us for possible publication, we read it with anger, revulsion from its central thesis, dislike of the way it said its say no less than of its actual content..."
It is compelling reading to say the least. The most frightening of Hauser's predictions turned out not to be true. Americans, Germans and the rest of Europe eventually united to make the best world they could out of the ashes of the old. But it might not have turned out that way. As American culture, economic power and military influence are a global phenomena today, this book has some remarkable insights as to how that can be perceived by those with completely alien traditions.